SAG HARBOR, N.Y., August 15, 2017 — Dating back to the 1840’s, The American Hotel is a classic, historic structure in the middle of Sag Harbor. After falling into disrepair, the building was purchased in 1971 by Ted Conklin, who lovingly restored the property. The American Hotel is one of a kind. 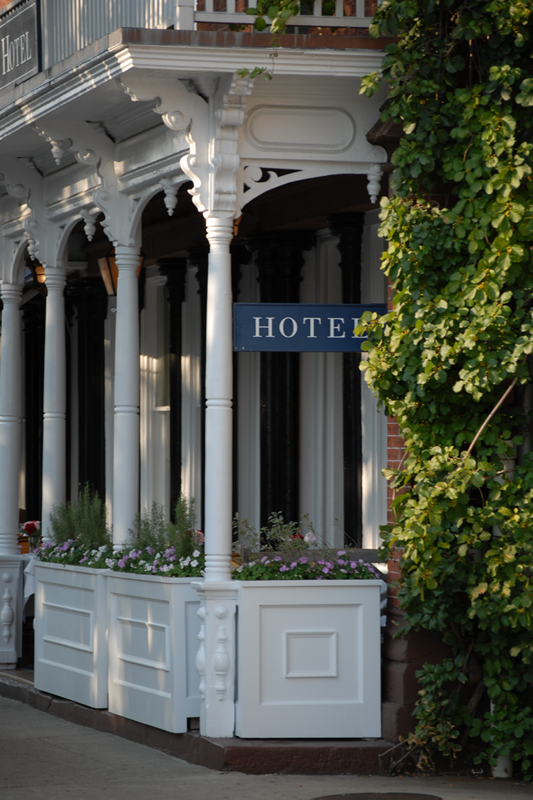 It combines fine dining, gorgeous atmosphere, and 40 years of Sag Harbor history. It’s a place where literary icons, rock stars, and local firefighters intermingle as members of a casually relaxed community. With an emphasis on refined, modern French cuisine, farm-to-table fresh ingredients, exceptional seafood, and a 30,000-bottle wine list, the American Hotel is both a Hamptons social center and an exquisite, fine-dining experience. Nobody can really remember who first said of the front porch at Singapore’s Raffles Hotel that “if one sits there long enough, one will eventually meet everybody who is anybody.” Sag Harbor cannot be said to be Singapore, but there are those summer nights when the heat is thick and damp and packs—of yachtsmen and their expensive wives, of giddy teenagers, of prosperous New Yorkers of all stripes—shuffle up and down Main Street. 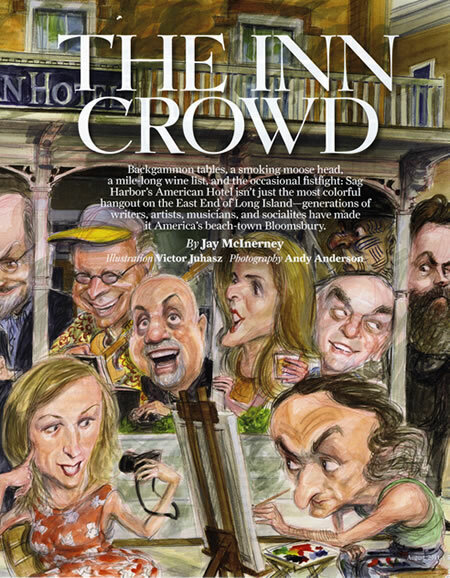 And when the Jitney lurches right up beside the American Hotel’s own famous porch just after midnight, well, it feels quite a bit like a festive nerve center for our very own surreal late-imperial America: “Everybody who is anybody?” On any old summer evening, there are too many boldfaced names to mention. (And fun ones, too. I ducked in a while back to buy a cigar when I collided with the now departed Larry Hagman. Major Nelson! J. R. Ewing himself! On the South Fork—and far, far away from Southfork). That same summer, Governor Andrew Cuomo’s security detail was anxious about the state’s chief executive dining with Billy Joel out on the porch. The Governor and the Piano Man. Just another steamy midseason night at the American Hotel. The Hotel’s living room–sized lobby area and its barroom marry the masculinity of the 21 Club in its heyday—particularly in the hotel’s back room—to the genteel eccentricities of a London dining club. 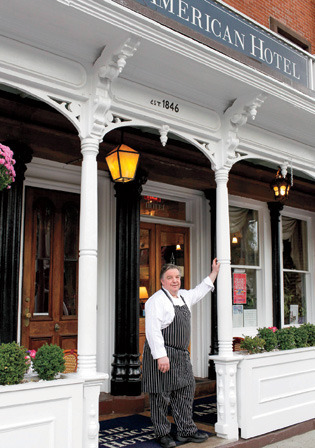 Ted Conklin, the ever dapper owner, visionary, carpenter, rescuer, sommelier, long-ago resident and chef, and the still presiding pasha of the hotel, was born to an ancient and storied Long Island family. After making his way through Lawrenceville, Babson and a stint as a farmer near the Canadian border, he decided in 1971 that the decrepit former boardinghouse on Main Street (built ca. 1824) deserved to be revived as an oasis of civility for a town whose industrial bottom had just fallen out. The building had not hosted guests for better than four decades, and its ancient owner was using the first-floor dining room as a residence. The story of Theodore Brigham Conklin III standing in the basement, knee-deep in coal dust and removing it by the bucketful, is personal history become village lore. After banging nails and hanging wallpaper himself, he braved the winter of ’71–’72 in a building that still had four privies in back. Ted opened the restaurant for Independence Day weekend in 1972 while serving as his own chef. At this writing, the hotel’s wine list is better than 85 pages long, and there are more than 30,000 bottles beneath the floorboards in the barroom. Wine Spectator has faithfully bestowed its Grand Award on the cellar for decades. The hotel is presently one of only 87 restaurants worldwide to receive the honor. Meanwhile, outside the hotel’s doors, Sag Harbor lays a strong claim to being the most coveted and most exciting village on the East End. In terms of pure commerce and cachet, the place has finally caught up with Ted’s long-ago vision. Deep, dense bags of cash are being exchanged for tiny old village houses, and the Main Street storefronts are looking chicer by the day. The hotel’s competition at the very top end of the culinary heap is always shifting and expanding, particularly in both East Hampton and Bridgehampton. Sag Harbor’s own Baron’s Cove, once basically a motor inn, is being so radically renovated and reinvented that American Hotel mainstay and oenophile Jay McInerney is serving as a “curator” of the restaurant wine list, which has replaced the outdoor Coke machines and ice makers. How could the new joint’s selections not be at least slightly influenced by McInerney’s decades-long enjoyment of the Conklin cellar? A glowing tribute, but perhaps a slightly inconvenient one as well—competition as a sincere form of flattery. There were even swirling rumors—dismissed by Ted himself and now somewhat receded—that the hotel might be for sale. To Ralph Lauren, no less. To some large extent, Sag Harbor has met the hotel and become the town that the hotel itself imagined. Once an outpost, the American Hotel is now a venerable temple. It embodies and encapsulates a good deal of what sets Sag Harbor apart—for now. But can that balance last? Will success ruin the ecosystem? 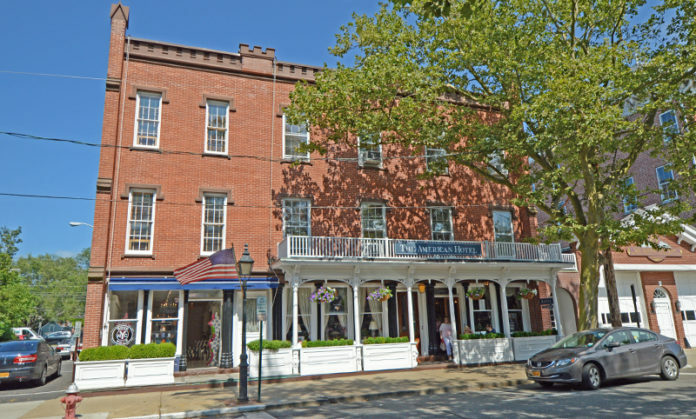 And if Sag Harbor as a whole has been remade in the hotel’s image, where does the boardinghouse now stand? Ted was in residence last October as Sag Harbor began to again feel like a village. I had crab cakes with my shawl-wrapped friend as a hearty-ish few of us slipped in what stood to be a last October evening out on the porch. It’s possible that a cigar was smoked in closerthan-strictly-approved distance from the hotel door. Jimmy Buffett strolled out of the barroom and chatted away with several diners on the porch. It was that absolutely priceless annual moment when the days and the waters of Long Island are still warm and when everyone with obligations back in the world has left to take care of them. From a distance, Ted seemed to be reveling in the evening. But I thought of the quiet and the coming chill when he later remembered what 1971 had looked like on Main Street. Bulova had abandoned its watch factory, and NASA budget cuts had brought Grumman’s work on the Apollo program to an abrupt end. “Basically overnight, 1,500 jobs vanished, and the population of the town plummeted to 2,000. There was a palpable tension between locals and the New Yorkers who began to trickle in to buy the old family houses.” Ted had a young family and was living upstairs from the freshly renovated barroom. Electricity had just been added to the building, but Conklin’s truck had to be sacrificed to pay the plumbing bill. The guiding vision had been for the hotel to be a great haven for one and all: artists, writers, haves, and have-nots. But bar fights were a symptom both of the town’s economic body blows and of the intermingling of different socioeconomic worlds. Four decades and much big success later, Conklin the raconteur makes it all sound quite the adventure. But it’s the real rawness of that time and place and the unlikeliness of the ultimate business win that seem to add an enduring spring to Ted’s step. He certainly earned it. By late January, the fireplace in the hotel’s barroom had become blessed relief from the cold winds coming off the harbor. Peconic Bay oysters from Pickerell’s farms and a spinach salad avec lardons did the evening’s trick admirably. (Veteran bartender Vinnie Nom—an institution entirely in his own right—conjured dinner post-deadline.) Julie Keyes, local artist, operator, gal about town and sometimes Conklin associate/always Conklin friend, was cackling over Ted’s handling of her cantankerous septuagenarian beau, the accomplished Israeli sculptor Nathan Joseph. Nathan, who is well known for making his views quite, um . . . well known, is a fixture at the hotel’s bar. In honor of all the outspokenness, Ted had an exquisite little framed sign saying “NATHAN, PLEASE BE QUIET” made so that it might be placed gently in front of the artist anytime the conversation seemed to be getting too involved. “Ha! Can you believe it? !” roared Julie. For a certain kind of regular, it was the highest compliment imaginable. Ted was in Palm Beach for the winter, but still present in spirit—both in the steady operation of the hotel, but also in minds of friends in Sag Harbor. Over at the Dockside Bar & Grill on Bay Street, co-owners Stacy Sheehan and Elizabeth Barnes volunteered lots of Ted Conklin tales, all of which fit squarely into either the “mentor” or “rascal” categories. Ted has always enjoyed their more casual establishment, and both women feel that he has been an invaluable supporter and advisor for their own considerable success just down the street from the hotel. Meanwhile, Stacy and Elizabeth, like so many others, marvel at his ability to consume lots of the best booze, stay up late, weigh in knowledgeably—or at least persuasively—on a great many subjects, and then to positively attack the following workday. All this while looking as though cared for by a valet and a Jermyn Street barber. It’s a recurring theme: No one can quite figure out how Ted runs. A former hotel employee added that Ted, who has a two handicap, doesn’t appear to do much more than casually tune up his golf game a couple of times a year. I heard things about “faster than a speeding bullet” and “leaping tall buildings in a single bound” but could not verify them. April finally came, and so did Ted. Back to Sag Harbor for a friend’s birthday at the hotel, and then on his way to Villa d’Este on Lake Como for Easter, a lovely lady on his arm. It all brought me back to my original curiosity about the hotel and about this hotelier’s vision. Had it been 21 that was the inspiration? The old Connaught? Ted set me straight. “It was the Patio in Westhampton,” he said. “Or the Ambassador Inn in East Quogue. They were the places where the town and its residents. Anchored in civics, actually. It’s precious and has made for a lovely little town—at a drastically escalating price point. With Sag Harbor now so in demand, will the next wave of restaurateurs and entrepreneurs be willing or able to tend that flame? Will they want to? Julie Keyes and Nathan Joseph, who live about 80 yards from the hotel, lost power during Hurricane Sandy. But it wasn’t a problem. As the seriousness of the storm became more apparent, Ted put out the word for anyone who was in a jam to come to the hotel. The building was doing just fine on its generator, and he had rooms as well as a whole bunch of lobster “he said he needed to get rid of.” So people came and filled up the hotel for shelter and for company and to ride out the storm. There was ample booze and plates of lobster salad sandwiches on white bread. And as the storm raged outside, Ted Conklin rallied his huddled masses, and old standards and vaudeville songs were sung long into the night. 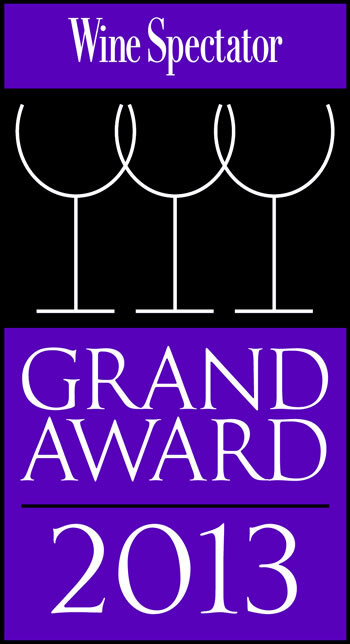 If by now you’ve given up all hope of finding a truly superior wine list in the Hamptons, why not seek out one of the greatest in the country – the 2,500-selection, Wine Spectator Grand Award-winning tome at the beautiful American Hotel? This restaurant is my personal favorite for its serious commitment to food and wine, its setting in the enchantingly picturesque town of Sag Harbor and its own antique prettiness. Spread throughout the 1846 structure are four very different dining rooms: one with a charming skylight, another done in Victoriana, another with fire places and one with a mounted moosehead. Once notorious for its hauteur, the American Hotel is now an affable place, and I found nothing but warm hospitality among the staff. The wine list is rich in just about every region and category imaginable, right down to the best producers from up-and-coming areas like Spain’s Tarragona, from which we chose a superb modern-style blend – Capafons-Osso Masia Esplanes Unfiltered ’96 ($42). There are also vertical holdings of Romanée-Conti on a scale rarely seen anywhere, and a thorough Long Island selection, all proof of the personal interest owner Ted Conklin takes in the list. Odd, then, that there is no on-premise sommelier to guide you through this gargantuan screed. The menu tries to please everyone, with plenty of old-fashioned French-continental items, some Italian pastas, even sushi and sashimi-including a vegetarian sushi option. Best to go with what seems most indigenous here – a ruddy lobster bisque, a delightfully fresh-flavored crab rémoulade, a starter of scallops with a glaze of white polenta. The hefty veal chop gets a generous helping of porcini and sweet carrots in a fine, dark reduction, while succulent striped bass is served with a lush Champagne beurre blanc. Finish with a wide wedge of moist chocolate torte, or perhaps a crunchy macadamia tart. The Hamptons may well have started out as a retreat for those seeking to get away from big city diversions, but now those diversions have arrived in numbers that make eating out in the Hamptons more like dining out back in town. It’s just tougher to get a table out here than back there.